NABSQNO 12S-761388-3945123. This unnamed arch is an old alcove natural arch eroded through Point Lookout sandstone. 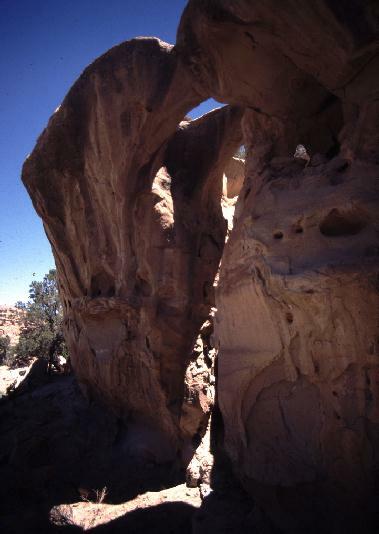 The arch is well separated from, and only partially occluded by, the cliff behind it. Interestingly, there may once have been a second alcove natural arch between this arch and the cliff. It appears to have formed and then collapsed during the life of the surviving arch. This arch is visible east of highway 371 about 19 miles north of Thoreau, McKinley County, New Mexico. However, because it is on the Navajo Nation, non-Navajos must obtain the services of a guide to get any closer than the highway. © 2003,2008 by Jay H. Wilbur, All Rights Reserved.